Hidden truth underneath the loose hair - We dare you! It has been quite a time since I updated our situation… After Hilma’s itches in autumn (which were cured with short cortisone regimen and change in her diet) everything has stayed as it has been, almost. Hilma still has 100 mg of Atopica daily and 10 ml of Megaderm. Her diet is fish, potatoes and vegetables. I have not washed Hilma since December and I have noted that she has some crust above her head. Situation has gotten gradually worse, but is has not seemed to disturb her. So we are back to regular washing and oiling again… Luckily the only place were this was found was above her head behind ears. Infected area continues down the upper neck (approximately to the extent where the picture is cropped). Worst part is the one in the picture. So that’s about it for now. I’ll try to take pictures weekly and we’ll see how washing and oiling works. 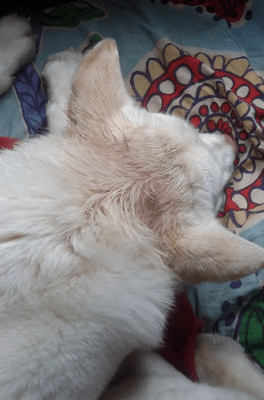 American akita owner from Finland struggling to get along with SA diseased dog.